Lyme disease is an infection caused by a corkscrew-shaped bacterium called, Borrelia burgdoferi. These bacteria are spread most commonly by the bite of a Blacklegged Tick (formerly known as Deer Ticks), Ixodes scapularis, and is the most common tick-transmitted disease known to date. These ticks can be found throughout the province of Ontario, and have exploded in the Durham region (including Brooklin!) over the last few years. Ticks are very closely related to spiders, and when unfed are typically small (1 to 5 mm in length), and all active stages feed on blood. Ticks cannot fly (thankfully!) and actually move quite slow. They come into contact with people or animals by positioning themselves on tall grass and bushes, and attaching to the person or animal as they walk by. 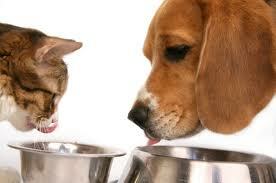 Yes, your dogs are at risk! Dogs can contract Lyme disease from the bite of a tick. Once in the bloodstream, the Lyme disease organism is carried to many parts of the body and is likely to localize in joints, giving the dog the symptom of generalized pain, and can be confused with arthritis. Unlike in arthritis, joint pain in Lyme disease typically “jumps” from joint to joint, and may resolve and reoccur for months after the initial bite. Many dogs with Lyme disease are taken to the veterinarian because they seem to be experiencing generalized pain (mild to very severe), fever and loss of appetite. However, many of these symptoms do not appear until a few weeks (or even months) after the initial bite. A few dogs may develop swollen lymph nodes, and Lyme positive dogs can develop life threatening kidney problems. Heart and neurological disease has been suspected in Lyme positive dogs, but has yet to be proven. Lyme disease can also be transmitted to people, but not through your dog. 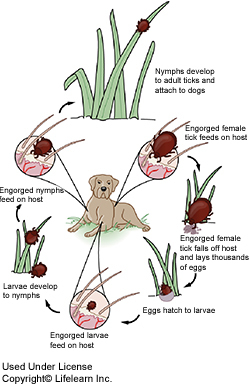 Just as in dogs, Lyme disease is transmitted to people by the bite of a tick. So you cannot contract Lyme disease from your dog, nor can you give Lyme disease to your dog (or other people at that!). Many people with Lyme disease develop a characteristic “bull’s-eye” rash at the site of the bite within thirty days. Other symptoms tend to mimic the flu, and can include: fever, headache, muscle and joint pains, and fatigue. In Lyme disease left untreated in people, it can progress to the following symptoms such as: neurological abnormalities, cardiac conditions, rheumatological conditions such as arthritis as well as multiple skin lesions. Ticks and Lyme disease are on the rise! Stay tuned for Lyme disease and our pets Part 2 – How it’s diagnosed, how it’s treated, and how to prevent it. **Interesting Fact** Lyme disease has been called Lyme disease ever since 1975, when an astute doctor recognized it in a cluster of children near the town of Lyme, Connecticut!